team come out as winners. 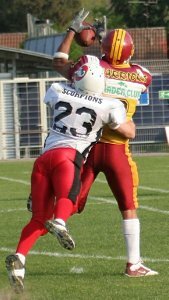 later Scorpions TE Sascha Wurster fumbled the ball for another turnover. pick for the home team with an athletic move in the next drive of Graz. of their own defense and had to punt the ball after short drives. lead for Graz at halftime. the crossbar to make it 3:10.
knew what was at stake. for 78 yards to make it 3:24. RUSHING  No. Gain  Loss  Net  TD  Lg  Avg. KICKOFFS  No. Yds  TB  OB  Avg. FUMBLES: Graz Giants-C.Kranz 1-1. Stuttgart Scorpions-S.Wurster 1-1; H.Rashid 1-1; P.Geiger 1-1. 31  G.Kodella   10  2  12  2/3   1  .   .   .  .  .   .
4   S.Carter   9  . 9  .   .  1-78  .   .  .  .   .
50  J.Canetti   6  . 6  2/7   . .   .   .  .  1/6   . 57  M.Werosta   4  . 4  . 1  .   .   .  .  .   .
7   M.Schneeweiss   4  . 4  .   .  .   .   .  .  .   .
42  C.Schreiner   3  1  4  .   .  2-0   . 1  .  .   .
5   M.Muheize   3  . 3  .   .  .   .   .  .  .   .
96  P.Grassegger   3  . 3  1/5   . .   .   .  .  1/5   . 21  C.Kranz   2  . 2  . 1  .   .   .  .  .   .
52  B.Zipper   1  . 1  .   .  .   .   .  .  .   .
37  F.Mittl   1  . 1  .   .  .   .   .  .  .   .
1   W.Hofbauer   1  . 1  .   .  .   .   .  .  .   .
30  T.Jantscher   1  . 1  .   .  .   .   .  .  .   .
32  M.Rotheneder   1  . 1  .   .  .   .   .  .  .   .
33  T.Werner   . 1  1  .   .  .   .   .  .  .   .
48  H.Egger   . 1  1  .   .  .   .   .  .  .   .
18  B.Pansy   .  .  .  .   .  .   1-30  2  .  .   .
28  H.Fleck   6  1  7  .   .  .   .   .  .  .   .
34  J.Scott   6  . 6  1/1   . .   .   .  .  .   .
38  O.Metzger   5  1  6  1/4   . .   .   .  .  .   .
66  V.Ntonas   3  . 3  .   .  .   .   .  .  .   .
58  M.Rendsburg   3  . 3  2/7   . .   .   .  .  1/5   . 23  S.Freiwald   2  1  3  .   .  .   1-27  .  .  .   .
24  A.Musch   1  2  3  .   .  .   .   .  .  .   .
15  H.Rashid   2  . 2  .   .  1-10  .   .  .  .   .
16  A.Frey   2  . 2  . 1  .   .   .  .  .   .
6   C.Wollin   2  . 2  .   .  .   1-0   .  .  .   .
99  J.Kerduff   1  1  2  1/3   . .   .   .  .  .   .
92  D.Mirus   1  1  2  1/3   . .   .   .  .  .   .
36  E.Gueyueldar   1  . 1  .   .  .   .   .  .  .   .
Graz Giants: 1-W.Hofbauer, 9-M.Herdey, 13-C.Gunn, 16-S.Lechner, 20-M.Nerad, 30-T.Jantscher, 32-M.Rotheneder, 37-F.Mittl, 39-C.Mudrak, 48-H.Egger, 51-M.Florian, 52-B.Zipper, 56-A.Weinberger, 60-M.Wechsler, 68-T.Hohenwarter, 72-F.Friedrich, 75-D.Strehle, 81-M.Biedenkapp, 84-C.Friedl, 88-T.Lischnig, 90-C.Glaser, 94-C.Bierbamer, 98-M.Fekonja. Stuttgart Scorpions: 3-G.Michel, 5-A.Spidle, 8-A.Schoeller, 10-J.Tipton, 11-A.Becker, 16-A.Frey, 17-K.Anastiassidis, 22-T.Avella, 27-A.Mecherlein, 29-D.Urban, 31-R.Schneider, 36-E.Gueyueldar, 47-D.Brandmayer, 50-F.Guelbahar, 55-Y.Sezgin, 56-M.Moser, 59-P.Podolski, 62-K.Ansu Yeboah, 83-E.Grundgeiger, 87-D.Stock, 90-S.Wurster, 91-S.Gavanda, 98-I.Papadopoulos. Gg  1-10 at Gg30 GG ball on GG30. 81-M.Biedenkapp kickoff 60 yards to the SS10, 7-C.Jackson return 8 yards to the SS18 (37-F.Mittl). Ss  1-10 at Ss18 4-I.Vandever pass incomplete to 21-P.Geiger. Ss  2-10 at Ss18 21-P.Geiger rush for 4 yards to the SS22 (31-G.Kodella). Ss  3-6 at Ss22 4-I.Vandever pass intercepted by 18-B.Pansy at the SS30, 18-B.Pansy return 30 yards to the SS0, TOUCHDOWN, clock 00:00. 81-M.Biedenkapp kickoff 62 yards to the SS8, 7-C.Jackson return 14 yards to the SS22 (4-S.Carter;31-G.Kodella). Ss  1-10 at Ss22 21-P.Geiger rush for 1 yard to the SS23 (96-P.Grassegger). Ss  2-9 at Ss23 4-I.Vandever pass complete to 90-S.Wurster to the SS24, fumble forced by 57-M.Werosta, fumble by 90-S.Wurster recovered by GG 42-C.Schreiner at SS23. Gg  1-10 at Ss23 2-T.Ricks pass complete to 81-M.Biedenkapp for 10 yards to the SS13, 1ST DOWN GG (6-C.Wollin). Gg  1-10 at Ss13 11-M.Grassegger rush for loss of 4 yards to the SS17 (38-O.Metzger). Gg  2-14 at Ss17 2-T.Ricks pass complete to 5-M.Muheize for 5 yards to the SS12 (28-H.Fleck). Gg  3-9 at Ss12 2-T.Ricks pass complete to 5-M.Muheize for 12 yards to the SS0, clock 00:00, PENALTY GG Offense Holding (72-F.Friedrich) 10 yards to the SS22, NO PLAY. Gg  3-19 at Ss22 2-T.Ricks pass intercepted by 23-S.Freiwald at the SS0, 23-S.Freiwald return 27 yards to the SS27 (5-M.Muheize). Ss  1-10 at Ss27 21-P.Geiger rush for 6 yards to the SS33 (7-M.Schneeweiss). Ss  2-4 at Ss33 21-P.Geiger rush for 3 yards to the SS36 (52-B.Zipper). Ss  3-1 at Ss36 21-P.Geiger rush for loss of 1 yard to the SS35 (31-G.Kodella). Ss  4-2 at Ss35 90-S.Wurster punt 43 yards to the GG22, out-of-bounds. Gg  1-10 at Gg22 2-T.Ricks rush for 7 yards to the GG29 (28-H.Fleck). Gg  2-3 at Gg29 5-M.Muheize rush for no gain to the GG29 (24-A.Musch), PENALTY SS Defense Offside 5 yards to the GG34, 1ST DOWN GG, NO PLAY. Gg  1-10 at Gg34 2-T.Ricks pass complete to 11-M.Grassegger for 19 yards to the SS47, 1ST DOWN GG (23-S.Freiwald). Gg  1-10 at Ss47 2-T.Ricks pass intercepted by 6-C.Wollin at the SS25, 6-C.Wollin return 0 yards to the SS25. Ss  1-10 at Ss25 21-P.Geiger rush for 4 yards to the SS29 (31-G.Kodella). Ss  2-6 at Ss29 4-I.Vandever rush for 3 yards to the SS32 (96-P.Grassegger). Ss  3-3 at Ss32 PENALTY SS False Start (77-D.Lammel) 5 yards to the SS27. Ss  3-8 at Ss27 4-I.Vandever rush for 5 yards to the SS32, out-of-bounds (31-G.Kodella), PENALTY SS Offense Holding declined. Ss  4-3 at Ss32 90-S.Wurster punt 28 yards to the GG40, downed. Gg  1-10 at Gg40 GG ball on GG41. Gg  1-10 at Gg41 5-M.Muheize rush for 12 yards to the SS47, 1ST DOWN GG (34-J.Scott;24-A.Musch). Gg  1-10 at Ss47 11-M.Grassegger rush for 10 yards to the SS37, 1ST DOWN GG (28-H.Fleck). Gg  1-10 at Ss37 5-M.Muheize rush for 3 yards to the SS34 (99-J.Kerduff), PENALTY SS Defense Offside (99-J.Kerduff) 5 yards to the SS32, NO PLAY. Gg  1-5 at Ss32 2-T.Ricks pass complete to 5-M.Muheize for 6 yards to the SS26, 1ST DOWN GG (38-O.Metzger). Gg  1-10 at Ss26 5-M.Muheize rush for 11 yards to the SS15, 1ST DOWN GG (38-O.Metzger). Gg  1-10 at Ss15 5-M.Muheize rush for 8 yards to the SS7 (28-H.Fleck). Gg  2-2 at Ss07 Start of 2nd quarter, clock 00:00. Gg  2-2 at Ss07 2-T.Ricks pass incomplete to 11-M.Grassegger. Gg  3-2 at Ss07 PENALTY GG Delay of Game (2-T.Ricks) 5 yards to the SS12. Gg  3-7 at Ss12 2-T.Ricks pass complete to 86-K.Geier for 5 yards to the SS7 (15-H.Rashid;23-S.Freiwald). Gg  4-2 at Ss07 81-M.Biedenkapp field goal attempt from 25 GOOD, clock 00:00. 81-M.Biedenkapp kickoff 56 yards to the SS14, out-of-bounds, SS ball on SS35. Ss  1-10 at Ss35 4-I.Vandever pass incomplete to 85-M.Thiel. Ss  2-10 at Ss35 21-P.Geiger rush for 4 yards to the SS39 (31-G.Kodella). Ss  3-6 at Ss39 4-I.Vandever pass incomplete to 15-H.Rashid. Ss  4-6 at Ss39 90-S.Wurster punt 25 yards to the GG36, out-of-bounds. Gg  1-10 at Gg36 11-M.Grassegger rush for 2 yards to the GG38 (58-M.Rendsburg). Gg  2-8 at Gg38 2-T.Ricks pass incomplete to 11-M.Grassegger. Gg  3-8 at Gg38 Timeout Graz Giants, clock 00:00. Gg  3-8 at Gg38 2-T.Ricks rush for 5 yards to the GG43 (6-C.Wollin). Gg  4-3 at Gg43 62-C.Kipperer punt 39 yards to the SS18, 15-H.Rashid return 4 yards to the SS22 (1-W.Hofbauer). Ss  1-10 at Ss22 4-I.Vandever rush for 12 yards to the SS34, 1ST DOWN SS (42-C.Schreiner). Ss  1-10 at Ss34 21-P.Geiger rush for 1 yard to the SS35 (31-G.Kodella;33-T.Werner). Ss  2-9 at Ss35 4-I.Vandever rush for 4 yards to the SS39 (4-S.Carter). Ss  3-5 at Ss39 21-P.Geiger rush for 7 yards to the SS46, 1ST DOWN SS (31-G.Kodella). Ss  1-10 at Ss46 4-I.Vandever pass complete to 11-A.Becker for 18 yards to the GG36, 1ST DOWN SS (42-C.Schreiner). Ss  1-10 at Gg36 4-I.Vandever sacked for loss of 5 yards to the GG41 (96-P.Grassegger). Ss  2-15 at Gg41 4-I.Vandever pass incomplete to 22-T.Avella. Ss  3-15 at Gg41 4-I.Vandever rush for 16 yards to the GG25, 1ST DOWN SS, out-of-bounds (4-S.Carter). Ss  1-10 at Gg25 4-I.Vandever rush for 6 yards to the GG19 (4-S.Carter;31-G.Kodella). Ss  2-4 at Gg19 4-I.Vandever pass incomplete to 7-C.Jackson. Ss  3-4 at Gg19 Timeout Stuttgart Scorpions, clock 00:00. Ss  3-4 at Gg19 4-I.Vandever rush for 8 yards to the GG11, 1ST DOWN SS, out-of-bounds. Ss  1-10 at Gg11 21-P.Geiger rush for 2 yards to the GG9 (57-M.Werosta). Ss  2-8 at Gg09 PENALTY SS False Start (22-T.Avella) 5 yards to the GG14. Ss  2-13 at Gg14 21-P.Geiger rush for no gain to the GG14 (50-J.Canetti). Ss  3-13 at Gg14 4-I.Vandever pass incomplete to 85-M.Thiel (18-B.Pansy). Ss  4-13 at Gg14 90-S.Wurster field goal attempt from 30 MISSED - short, spot at GG0, clock 00:00. Gg  1-10 at Gg00 GG ball on GG20. Gg  1-10 at Gg20 5-M.Muheize rush for 2 yards to the GG22, out-of-bounds (38-O.Metzger). Gg  2-8 at Gg22 2-T.Ricks rush for no gain to the GG22 (66-V.Ntonas;28-H.Fleck). Gg  3-8 at Gg22 2-T.Ricks pass incomplete to 11-M.Grassegger. Gg  4-8 at Gg22 62-C.Kipperer punt 43 yards to the SS35, 15-H.Rashid return 10 yards to the SS45, fumble forced by 21-C.Kranz, fumble by 15-H.Rashid recovered by GG 42-C.Schreiner at 50 yardline. Gg  1-10 at Gg50 PENALTY GG False Start 5 yards to the GG45. Gg  1-15 at Gg45 2-T.Ricks sacked for loss of 5 yards to the GG40 (58-M.Rendsburg). Gg  2-20 at Gg40 2-T.Ricks pass complete to 11-M.Grassegger for 34 yards to the SS26, 1ST DOWN GG (34-J.Scott). Gg  1-10 at Ss26 End of half, clock 00:00. Gg  1-10 at Ss26 Start of 3rd quarter, clock 00:00, SS ball on SS30. 90-S.Wurster kickoff 34 yards to the GG36, 11-M.Grassegger return 6 yards to the GG42 (36-E.Gueyueldar). Gg  1-10 at Gg42 11-M.Grassegger rush for 5 yards to the GG47 (28-H.Fleck;99-J.Kerduff). Gg  2-5 at Gg47 2-T.Ricks pass complete to 86-K.Geier for 18 yards to the SS35, 1ST DOWN GG (23-S.Freiwald). Gg  1-10 at Ss35 5-M.Muheize rush for loss of 3 yards to the SS38 (99-J.Kerduff). Gg  2-13 at Ss38 2-T.Ricks pass complete to 21-C.Kranz to the SS2, fumble forced by 16-A.Frey, fumble by 21-C.Kranz recovered by SS 15-H.Rashid at SS5, 15-H.Rashid for 10 yards to the SS15 (21-C.Kranz). Ss  1-10 at Ss15 SS ball on SS15. Ss  1-10 at Ss15 4-I.Vandever pass complete to 7-C.Jackson for 11 yards to the SS26, PENALTY SS Offense Holding (74-F.Bidmann) 6 yards to the SS9, NO PLAY. Ss  1-16 at Ss09 21-P.Geiger rush for 11 yards to the SS20 (32-M.Rotheneder). Ss  2-5 at Ss20 PENALTY SS Delay of Game (4-I.Vandever) 5 yards to the SS15. Ss  2-10 at Ss15 22-T.Avella rush for 3 yards to the SS18 (31-G.Kodella). Ss  3-7 at Ss18 4-I.Vandever rush for 13 yards to the SS31, 1ST DOWN SS (31-G.Kodella). Ss  1-10 at Ss31 4-I.Vandever rush for no gain to the SS31 (50-J.Canetti). Ss  2-10 at Ss31 21-P.Geiger rush for 4 yards to the SS35 (50-J.Canetti). Ss  3-6 at Ss35 PENALTY SS False Start (89-G.Braschler) 5 yards to the SS30. Ss  3-11 at Ss30 Timeout Stuttgart Scorpions, clock 00:00. Ss  3-11 at Ss30 4-I.Vandever pass complete to 89-G.Braschler for 28 yards to the GG42, 1ST DOWN SS (5-M.Muheize). Ss  1-10 at Gg42 21-P.Geiger rush for 3 yards to the GG39 (4-S.Carter;42-C.Schreiner). Ss  2-7 at Gg39 4-I.Vandever pass incomplete to 85-M.Thiel (42-C.Schreiner). Ss  3-7 at Gg39 21-P.Geiger rush for 11 yards to the GG28, 1ST DOWN SS (42-C.Schreiner). Ss  1-10 at Gg28 4-I.Vandever pass incomplete to 15-H.Rashid. Ss  2-10 at Gg28 PENALTY SS False Start (89-G.Braschler) 5 yards to the GG33. Ss  2-15 at Gg33 4-I.Vandever rush for 6 yards to the GG27 (4-S.Carter). Ss  3-9 at Gg27 4-I.Vandever pass incomplete to 7-C.Jackson, PENALTY GG Defense Pass Interference (15-A.Ponce de Leon) 15 yards to the GG12, 1ST DOWN SS, NO PLAY. Ss  1-10 at Gg12 4-I.Vandever pass incomplete to 7-C.Jackson. Ss  2-10 at Gg12 21-P.Geiger rush for 3 yards to the GG9 (57-M.Werosta). Ss  3-7 at Gg09 4-I.Vandever pass incomplete to 21-P.Geiger. Ss  4-7 at Gg09 Timeout Stuttgart Scorpions, clock 00:00. Ss  4-7 at Gg09 90-S.Wurster field goal attempt from 25 GOOD, clock 00:00. 90-S.Wurster kickoff 45 yards to the GG25, 5-M.Muheize return 9 yards to the GG34 (15-H.Rashid;24-A.Musch). Gg  1-10 at Gg34 5-M.Muheize rush for no gain to the GG34 (38-O.Metzger). Gg  2-10 at Gg34 PENALTY GG False Start (62-C.Kipperer) 5 yards to the GG29. Gg  2-15 at Gg29 2-T.Ricks pass complete to 11-M.Grassegger for 7 yards to the GG36 (28-H.Fleck), PENALTY GG Personal Foul (71-G.Oberbichler) 18 yards to the GG18. Gg  2-26 at Gg18 3rd and 26. Gg  3-26 at Gg18 2-T.Ricks pass complete to 11-M.Grassegger for 14 yards to the GG32 (66-V.Ntonas). Gg  4-12 at Gg32 62-C.Kipperer punt 41 yards to the SS27, downed, PENALTY SS Ill. Participation 14 yards to the GG46, 1ST DOWN GG, NO PLAY. Gg  1-10 at Gg46 11-M.Grassegger rush for 9 yards to the SS45 (15-H.Rashid;34-J.Scott), PENALTY GG Offense Holding (62-C.Kipperer) 6 yards to the GG40, NO PLAY. Gg  1-16 at Gg40 2-T.Ricks pass complete to 5-M.Muheize for 44 yards to the SS16, 1ST DOWN GG (24-A.Musch). Gg  1-10 at Ss16 Start of 4th quarter, clock 00:00. Gg  1-10 at Ss16 11-M.Grassegger rush for 1 yard to the SS15 (28-H.Fleck;34-J.Scott), PENALTY SS Defense Offside 5 yards to the SS11, NO PLAY. Gg  1-5 at Ss11 2-T.Ricks pass complete to 11-M.Grassegger for 10 yards to the SS1, 1ST DOWN GG (16-A.Frey), PENALTY GG Defense Offside declined. Gg  1-G at Ss01 PENALTY SS Defense Offside (34-J.Scott) 0 yards to the SS1. Gg  1-G at Ss01 2-T.Ricks rush for 1 yard to the SS0, TOUCHDOWN, clock 00:00. 81-M.Biedenkapp kickoff 49 yards to the SS21, 15-H.Rashid return 22 yards to the SS43 (30-T.Jantscher;48-H.Egger). Ss  1-10 at Ss43 22-T.Avella rush for 4 yards to the SS47 (4-S.Carter). Ss  2-6 at Ss47 4-I.Vandever pass incomplete to 7-C.Jackson. Ss  3-6 at Ss47 4-I.Vandever rush for no gain to the SS47 (96-P.Grassegger;99-G.Purger), PENALTY GG Intentional Face Mask (96-P.Grassegger) 16 yards to the GG37, 1ST DOWN SS, NO PLAY. Ss  1-10 at Gg37 22-T.Avella rush for loss of 1 yard to the GG38 (50-J.Canetti). Ss  2-11 at Gg38 4-I.Vandever pass complete to 7-C.Jackson for 6 yards to the GG32 (7-M.Schneeweiss). Ss  3-5 at Gg32 4-I.Vandever pass incomplete to 7-C.Jackson (18-B.Pansy). Ss  4-5 at Gg32 4-I.Vandever pass incomplete to 7-C.Jackson (18-B.Pansy), PENALTY GG Defense Pass Interference (18-B.Pansy) 8 yards to the GG24, 1ST DOWN SS, NO PLAY. Ss  1-10 at Gg24 4-I.Vandever pass complete to 22-T.Avella for 6 yards to the GG18 (4-S.Carter). Ss  2-4 at Gg18 4-I.Vandever pass incomplete to 7-C.Jackson. Ss  3-4 at Gg18 21-P.Geiger rush to the GG20, fumble forced by 31-G.Kodella, fumble by 21-P.Geiger recovered by GG 4-S.Carter at GG22, 4-S.Carter for 78 yards to the SS0, TOUCHDOWN, clock 00:00. 81-M.Biedenkapp kickoff 65 yards to the SS5, 15-H.Rashid return 29 yards to the SS34 (4-S.Carter). Ss  1-10 at Ss34 4-I.Vandever pass complete to 22-T.Avella for 25 yards to the GG41, 1ST DOWN SS (7-M.Schneeweiss). Ss  1-10 at Gg41 21-P.Geiger rush for 9 yards to the GG32 (57-M.Werosta). Ss  2-1 at Gg32 4-I.Vandever pass complete to 7-C.Jackson for 31 yards to the GG1, 1ST DOWN SS (5-M.Muheize). Ss  1-G at Gg01 21-P.Geiger rush for no gain to the GG1 (50-J.Canetti). Ss  2-G at Gg01 Timeout Stuttgart Scorpions, clock 00:00. Ss  2-G at Gg01 4-I.Vandever pass incomplete to 89-G.Braschler. Ss  3-G at Gg01 21-P.Geiger rush for 1 yard to the GG0, TOUCHDOWN, clock 00:00. 90-S.Wurster kickoff 2 yards to the SS32, 11-M.Grassegger return 2 yards to the SS30. Gg  1-10 at Ss30 11-M.Grassegger rush for 3 yards to the SS27 (66-V.Ntonas). Gg  2-7 at Ss27 PENALTY GG Delay of Game (2-T.Ricks) 5 yards to the SS32. Gg  2-12 at Ss32 2-T.Ricks rush for 11 yards to the SS21 (34-J.Scott). Gg  3-1 at Ss21 37-F.Mittl rush for loss of 3 yards to the SS24 (92-D.Mirus). Gg  4-4 at Ss24 2-T.Ricks rush for 6 yards to the SS18, 1ST DOWN GG (34-J.Scott), PENALTY SS Defense Offside declined. Gg  1-10 at Ss18 PENALTY GG False Start (86-K.Geier) 5 yards to the SS23. Gg  1-15 at Ss23 2-T.Ricks rush for 7 yards to the SS16 (66-V.Ntonas), PENALTY GG Offense Holding 8 yards to the SS31, NO PLAY. Gg  1-23 at Ss31 11-M.Grassegger rush for loss of 2 yards to the SS33 (58-M.Rendsburg). Gg  2-25 at Ss33 37-F.Mittl rush for loss of 1 yard to the SS34 (34-J.Scott;92-D.Mirus). Gg  3-26 at Ss34 37-F.Mittl rush for 11 yards to the SS23, PENALTY GG Offense Holding declined. Gg  4-15 at Ss23 11-M.Grassegger rush for 1 yard to the SS22 (34-J.Scott;38-O.Metzger). Ss  1-10 at Ss22 SS ball on SS24. Ss  1-10 at Ss24 4-I.Vandever sacked for loss of 6 yards to the SS18 (50-J.Canetti). Ss  2-16 at Ss18 4-I.Vandever rush for 12 yards to the SS30 (7-M.Schneeweiss). Ss  3-4 at Ss30 End of game, clock 00:00.